While there may be some of us who shy away from one act plays and/or one actor productions; let me assure you this is NOT the usual show. 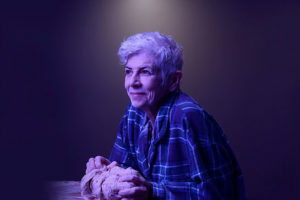 Mary Lynn Owen who has been working the stage for decades and is on the theatre faculty at Emory, is both the author and the performer, and it is an exceptional show which draws you in from the start. We meet Mary in her kitchen in the wee hours of the morning. She’s working off some stress by emulating her mother and making some bread from scratch. And while she is kneading the dough she recalls many episodes in her life, including family relationships, health issues and lots more. The tale takes place in a real kitchen onstage designed by Ann Beyersdorfer. But what comes out of some cabinets and the fridge may surprise and delight you. David deVries directs this opus which runs about 80 minutes and you wish it would not end. Mary Lynn Owen is on-stage and working the audience every single minute and you feel as if you were sitting up there listening to her one-on-one. Most of us can’t remember our names or addresses for 80 minutes, yet Mary tells it all. There are some lines in Spanish, but even if you don’t speak Spanish you’ll get the idea of what she’s saying.